What did HE do? What does he know? What is the secret? <— That, coupled with these recommendations, meant it was next on my list! Jennifer: MUST READ!!!!!!!!!!!!!!!! 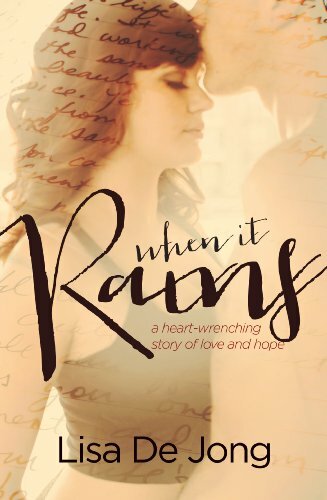 When it Rains by Lisa De Jong! ABSOLUTELY WONDERFUL! It is the best mix of heartache, falling in love, tissues and more love. It is a great book! Ashley: It’s the first book to make me cry in as long as I can remember. It is soul wrenchingly …. hopeful?…. tragic and soft, harsh and enlightening. I wish I could read it for the first time again, since it makes you FEEL. Move it up your list, but not unless you are ok with a crying hangover. Amy: When It Rains. O.M.G. I felt, Maryse. FELT. I won’t say what I felt because if you decide to read this one, you really shouldn’t know what to expect so you can get the full effect of it. I knock off half a star for some minor plot/content issues (I’m just opinionated, that’s all), but for the love of all that kicks my tail, I’m still feeling it. Jeanie: I finished When It Rains yesterday too &amp; cried my eyes out too! Sigh! So good though! Carrie: I’m finished and was a blubbering mess!! Omg! I’m in pain! Took my contacts out then put my glasses on. They fogged up from blubbering like a crazy person! My hubby probably thought I was nuts. Heheheh. Ohhhh I shouldn’t laugh at their pain, now should I? That’s not nice. And anyway, I was a blubbering mess, too. 😉 I know what y’all are talkin’ about. I have lots of moments I’d like to hold on to forever, but I’m afraid they will always be overshadowed by that one horrible memory I can’t let go of. (due to a tragic incident that stole her innocence, and her ability to trust). The most important thing I lost was my sense of self. It took seventeen years to build my foundation and it took mere minutes to tear it down. Beau notices but can’t get it out of her. He has no idea what’s wrong, and she won’t open up. She won’t trust him. So he’s just “there” for her in case she let’s him in again. The old Kate is gone… and she’s never coming back. And I’ll always hate it when it rains. But once he heads off to college, the only “security” in her life leaving, she feels more lost than ever. That is until she meets “Asher” at the restaurant where she works. There’s just something about him… and they connect, too. She’s got someone like Beau back in her life again, and this guy didn’t “know” the old Kate, so there’s nothing to disappoint him with. He just knows this “Kate” and since he, too… has some issues, overtime, they trust each other with their secrets. I’m in no shape to take him on as my project, and he sure as hell isn’t ready to deal with all my baggage. And despite all of that… they get really close. And then, that’s where everything gets… “crazy”. I’ll let you go on from here. So did I love it? Well, quite a bit, yes and a bit, no. The “no” is for the intro… being in her head, repeating the why’s of why she is how she is, the why’s of why she can’t tell anyone, the why’s of why the love of her life that loves her too, can’t ever know her truth. The why’s of why she loves him so, and the whys of why they can never be. Sure, “it” needed to be said, and clarified to the reader. It certainly set the tone, and it was a HUGE part of her emotional devastation, shame and self-punishment. We got to know her through those thoughts, after all. We needed to know this. But eventually I found myself skimming large parts as it was mostly one and the same, repeated, re-justified… to convince herself, and us. And even with all of that, I loved Beau with all of my heart. I hurt for him (even though I should have been hurting for her). I was sad that he was being punished (her very best friend in the world, the only person she loves as much as she does, the only one she trusts and the one she pretty much knows, loves HER unconditionally), because of her hang-up. This is the moment I’ve dreamt of for years. I was the princess waiting for my prince to come save me from the top of the highest tower. Now, I’m unreachable… even for Beau. Mind you… she had every right to that hang-up. She was violated one night by the “popular guy”, terrorized and meant to feel ashamed over and over again every time he placed himself in her vicinity. The ultimate bully. She never received the healing help she needed and so she was a mess. But there was just something about this part of the storytelling, that while “I got her”, still managed to keep me at arms length. …it all bleeds into every aspect of my life, and this is the reason we can’t be friends. I can’t let anyone else get hurt because of me. Everyone should stay away from me because, in the end, I know I’ll let them down. And then… she meets “Asher”. I was okay with this. I knew there’d be that “guy” that saves her. But it’s just how fast he came in, how fast they connected, and how quickly she confided in him that held me back even more. I was beginning to feel jaded. I knew there was a story to tell, but I felt as if we were sort of being fast-forwarded through the “intros” to get to the good stuff. And you know what? By the time the intense “stuff” happened, I still had not connected to “them”. And in my jaded huffing and puffing, knowing I must keep reading ’cause I needed to “get there” out of respect for these characters. And out of respect to y’all ’cause I knew you guys were loving it, and I knew somehow… even in my “jaded” I would love it, too. Just look at the reviews!!! Right? Right. Okay those who haven’t read this yet…. stop here you guys!! I don’t *think* I spoil it per se… but you know me and my need to “analyze” myself and I don’t want those that want NO more “ideas” about the book… venturing in the next review section. And this IS a book that I needed to self-analyze my experience, so I can’t help it. I swore to myself… since I “already knew” (don’t ask how I know… maybe it was a weird epiphany. Or mostly… I found it obvious enough. Maybe I’m just over-experienced in this new adult “book-theme” so now, I see it coming easier? ), but either way, I was sure I wouldn’t react the way my fellow readers were reacting. I was being a “negative nancy” … all “been there, done that” and pouting my way to the punchline, and I was feeling… “hardened” against this… theme. And once I hit the punchline, I was right! I KNEW IT!!!!! I even wrote “of course!” as a note in the reveal. I know, right? What’s up with that? Y’all know… I love to “book-hurt”, I love the angst, I love to physically react, but this one had me so upset that I was furious that you guys would tell me to read this (and yet had no right to be furious, because in the end, it is THAT… that made me love it). I was emotionally… all over the place. Mad at all of y’all, mad at the author, and mad at myself for being so selfish about this. Mad at the fact that I’ve sort of read this before. And mad at myself that even in it’s “familiarity” it got me BAD, anyway. So all that to say, I may not have connected much until about halfway through and then I TOTALLY connected like mad. The end? Still had me well enough… I was a bit… er. I dunno. I suppose there *could* have been more (slower again, please) in that respect. The characters deserved a gentler… more elongated ending, I think. But overall, where it counted… it was REAL. It was RAW. It was touching. It was exactly as it needed to be. And it made me forget for awhile… what my “issues” were with the first part of the book. Suddenly, that didn’t matter as much. 4 stars! (3 stars for the “bumpers” (beginning and end) but 5 stars for where it really got me, and it was a big enough part of the book that it wonderfully overshadows the rest). Mayse, I was actually one to go on your page an said it was a must read. You have to understand, I avoid emotional books at all costs. But this one – I still have not been able to articulate myself well enough to do this book justice. Your review made me laugh because when I got to the intense part, I had to put the book down (I was a slobbering mess) and was so upset with the author. I mean, COME ON!! It became really, really excruciating at times – but sooooo beautiful! I loved it, and have put it on my top list this year! By the way, I totally agree – NO MORE SAD BOOKS! Exact same reaction here, I was at “that gut punch” and tearing up infront of my husband, kept putting the book down to put myself back together, and then I swore no more sad books. I really did not think I would react that bad, till it “happened”. Hehe!! Yep… i’m takin’ a break from crying! When it Rains tore me up. I also had to take a break from crying. If you liked The Edge of Never, you’ll love this book as well, it is a MUST READ. OMG……..I should of been warned about this book before reading it at work, LOL…I didn’t read the review because I didn’t wont to spoil it, but OMG, talk about heart wrenching!!!!! Holy mess this is the worst book hangover I’ve had in a long time! Not an overtly emotional person but the story of Kate and Asher had me ugly crying and fearing for the longevity of my kindle. Wow is the only thing I can keep saying. Well played Lisa De jong well played.